We were at the beach Saturday for sunset when little kid came running up with something green and heavy in his arms. "What does he have? Is that a coconut?" "I think it's a watermelon?" "It can't be a watermelon." But it was a watermelon. He was laughing like a maniac as he zigged and zagged back and forth on the beach before unceremoniously dumping it at my feet. We were all cracking up by then because his insane laughter was infectious and the whole scenario was so strange. As the watermelon rolled on the ground in front of me, a little triangle shaped plug popped out. "Is that a...note? In the watermelon?" "A note? In the watermelon?" I peered inside and sure enough, there was a soggy, carefully folded piece of paper...inside the watermelon. I carefully pried it out with my fingertips and slowly unfolded it, draping it over my chair to dry and praying that the only thing on it was watermelon juice. Mr. Ashley told me to throw it away. CAN YOU IMAGINE? 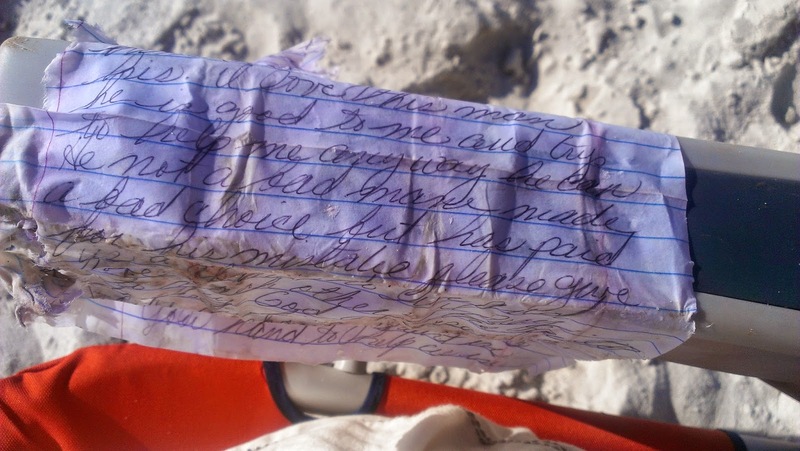 Throwing away a note you found folded up in a watermelon? He's a mad man. I carefully preserved it, scrunching myself up in the corner of my beach chair so it wouldn't touch me. 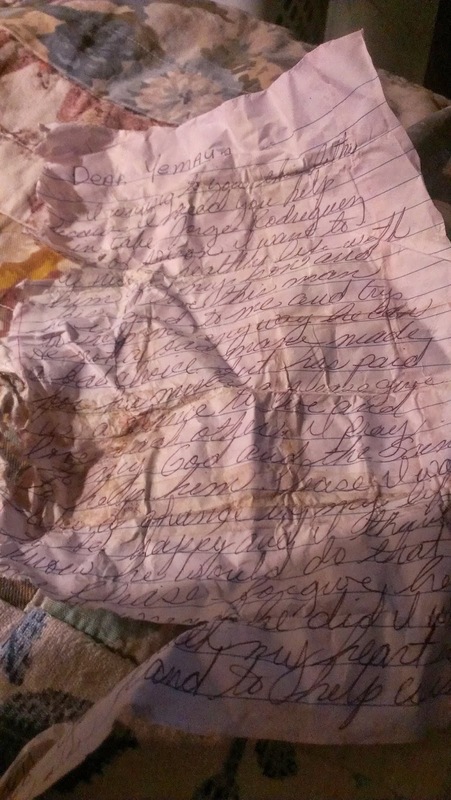 I just unfolded it to transcribe it to you though and it smells, so maybe he's right, maybe I should have thrown it away after reading it the first time. I writing to you this letter because I need your help in take (guy's name) out of prison. I want a nice and healthy life with him and my son and his. I love this man, he is good to me and trys to help me anyway he can. He is not a bad man, made a bad choice but has paid for the mistake. Please give us a chance to live and love each other. I pray to my God and the saints to help him. Please I would like to change my life to be happy and I know he would do that for me. Please forgive him the wrong he did. I write to you with my heart in your hand to help us in chance to live what I have of life left until I go home to live with him. Please forgive. and is signed with her name. Kind of a sad climax to my exciting Scooby Doo mystery. A quick google search reveals that Yemaya "is the great mother who lives and rules over the seas. Water is essential to life, so without Yemaya, life on earth wouldn't be possible." That's from a Santeria website. So, I don't know if little kid interrupted some voodoo magic or if our interference has ruined this poor desperate person's chances at happiness or not, but it made for a really odd day at the beach. I wish I could send her a watermelon back telling her to find happiness in herself, for her son. Super weird though, I couldn't make this kind of stuff up. This is friggin' awesome. Nothing cool washes up on the beach here... just a bunch of used hypodermic needles. Gotta love California! Wow that's crazy! 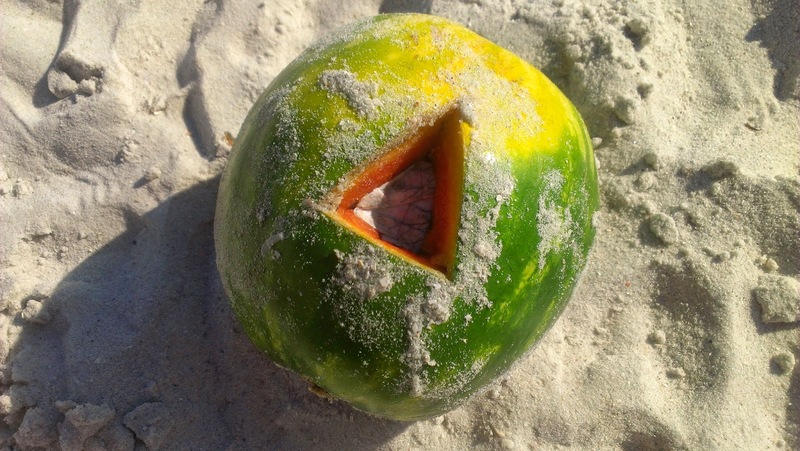 Amazing that the letter survived inside a watermelon like that. I wonder how far it traveled from.